How did the World Harp Ensemble come about? I’ve been playing ‘inclusive’ music since I was a kid, music that allowed professionals to shine and beginners (or kids, like me) to be an important part of the music. Because of that I got to be a PART of music with a high artistic caliber, playing along with stellar musicians from the time I could barely play or sing. So this idea of music that is created to have a place for everyone is part of my cultural DNA. Enter Shelley Fairplay: In 2014 I became friends with a harpist from Wales who has a similar view of combining musical inclusivity with virtuosic soloists, and in 2016 Shelley offered her own ensemble, “Dynamic Harps” as the testing ground to create a series of pieces that would fulfill this mission. When the World Harp Congress invited me to perform in the final concert in Hong Kong in 2017 I realized this was an opportunity to launch the World Harp Ensemble internationally. 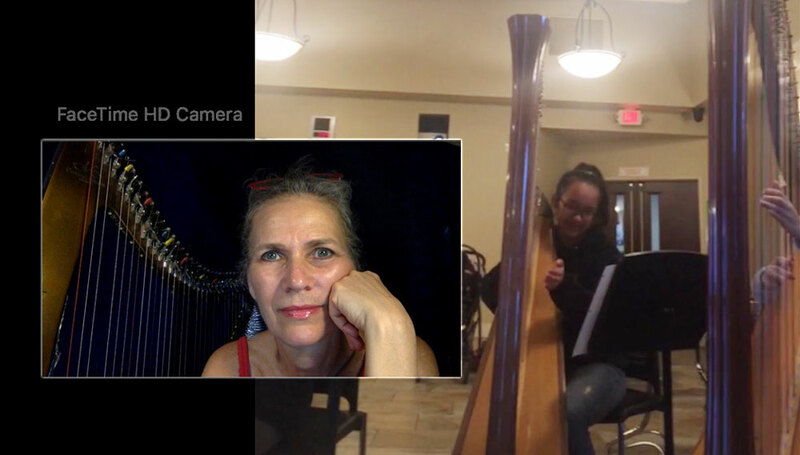 Since I created the “Hip Harp Academy” I’ve become aware that we, as harpists, are a world-wide community. Though broadly scattered throughout the world, a few reaching celebrity status — but with a growing foundation of impassioned amateurs, like-minded learners keen to support each other. The old world of the competitive elite-harpist now has a growing foundation of players who play for the love of playing alone, from children to beginners who start after the age of retirement. Creating the opportunities for people to be safe within their own technical level, and yet challenging for high-level performers is a powerful tool for learning and developing. It accelerates the progress not only of the ‘beginners’ but also the clarity of the soloist. The theme of the 2017 World Harp Congress is “East-meets-West.” I wanted to focus on what it means to ‘meet’ and to connect as musicians across cultural barriers. In my online school, Hip Harp Academy, I’ve discovered how powerful creative community is – and I want to expand that, creating a repertoire of deceptively simple musical ‘games’ so that any time any two harpists anywhere in the world are together, they have a way to play together spontaneously. What if Music was like Team Sports? Sports teams play a specific game (soccer, basketball, etc. ), everyone plays by the same rules, and each person plays a specific position. Jazz players ‘call’ a specific tune, they all follow the same basic guidelines of jazz improvisation, and each person plays a specific position or role (bass, melody, accompaniment) at any one time. I want us to be able to do that as harpists, whether we’re playing together for fun, building ensemble repertoire, or launching into an encore after a concert. I want it to work even if the harpists play different kinds of harps, don’t speak the same language and play at different technical levels. And I want the audience to have a part so they can play along. My mission is to create a series of ‘deceptively simple’ ensemble pieces that harpists can learn and play together spontaneously – just like any great game. One of the big advantages of music over sports is that every music game can include players of all technical levels, with the less-advanced players focusing on simpler, more supportive roles until they develop the confidence to step into the limelight a bit more. So every piece has space for a virtuoso-soloist to shine and each piece combines a sense of community, collaboration and creative challenge, from the very simplest line for the beginner through to the infinitely expandable improvisational space for a virtuoso. We had the first ensemble test at the CAMAC Harp Weekend in Wales in March, with a piece called “You Have a Voice.” Multi-level harpists learned, rehearsed and performed it in concert in about an hour’s worth of time, singing as they played, standing at their harps and performing with no music stands or stools – making it easy for them to move swiftly from the audience to the stage. The effect was like an instant ensemble and the feedback was that harpists found being part of the ensemble deeply moving because they could focus on the ensemble engagement versus fussing with notes. The result was musically rich, easy to play, and highly engaging both for audience and performers. Exactly what I was hoping it would be! I’ll be officially debuting the “World Harp Ensemble” project at the World Harp Congress in Hong Kong 2017 along with my UK collaborators, Shelley Fairplay and Eleanor Turner – plus additional players who will be at the Hong Kong World Harp Festival. YOU are right in the hub of this movement! 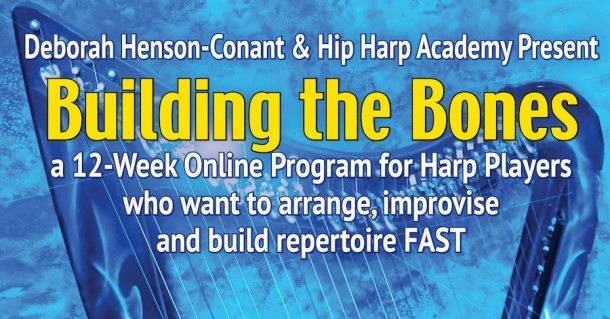 This class is the hub of the World Harp Ensemble project – and I’m encouraging harpists and harp-ensemble leaders around the world to download the music, learn the game-plans and share the games with their own ensembles. Then to videotape the results! You’re sitting in the hub, where harpists around the world can come to learn the basic guidelines and download the games. If you want to be part of the World Harp Ensemble Beta Test group, go to WorldHarpEnsemble.com (http://www.WorldHarpEnsemble.com where you can sign up to test out the ensemble music.